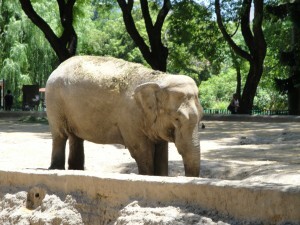 Our destination today was the Buenos Aires Zoo. Assuming that it would be a 30-45 minute walk, we set out from the hotel at 11:30. We’re not sure what time it was exactly, but, we were about 2/3 of the way and needed a short break – for water and a rest room. We spied a Starbucks, and went inside to purchase bottled water, and use the facilities. After a 15 minute rest, we resumed our walk. We were shocked when we finally arrived at the zoo at 1:00! With the break, we estimated the distance at 3.5 miles – we had no idea it was that far! The walk was really nice, and obviously, the time (and miles) flew by. One wonderful aspect of BA that we haven’t yet shared is that it is the greenest city we have ever visited. By green, we mean trees and gardens (not recycling, etc. – a cause very dear to us, as you all well know – but we digress). We thought San Francisco was amazing with a multitude of green space and parks (including Golden Gate Park, of course) and the tree-lined Embarcadero, but SF has nothing on BA in that regard. Considering the temperature this afternoon was near 90, the tree-lined street provided much relief during our extended stroll. Without further ado, we arrived at the zoo, promptly paid our admission, and spent the next few hours gazing at the animals. We were commenting on the tapirs, when another English-speaking couple asked us where we were from. It turns out they live in Los Gatos – about 40 minutes from our place in the city, and home to one of our favorite wineries, Testarossa. It truly is a small world! After several more hours on our feet, we took a taxi back to our hotel. We had a short break, and walked (yes, we walked some more!) to a local grocery for snacks and a bottle of wine. Local wine is really cheap – between $5 and $6 for a decent bottle. Considering that a glass of wine at the hotel is $10, this is a real bargain! And talking about a glass of wine in the hotel, this evening we ventured to the Plaza Bar, which was supposedly ranked in the top 9 hotel bars in the world. It was a disappointing experience (as is usually the case), but still a nice way to finish the day. 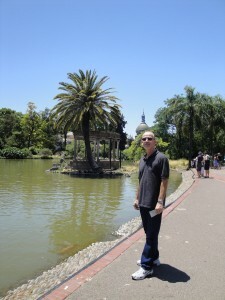 Buenos Aires sounds beautiful! Glad you took a taxi back to hotel instead of another 3.5 mile walk! You know the best wine bar is still ours!!!!!! !